Being a musician involves taking risks, or at least it should. Said risks don’t necessarily have to involve throwing furniture out of windows or drinking copious amounts of cough syrup. Already known as a genre-bending vocalist, Jack Davey has chosen to take things to the next level in her musical career with a three-part solo project. 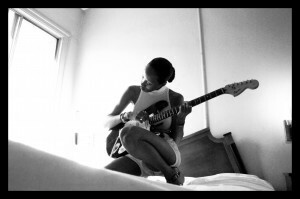 One-half of futuristic soul duo J*DaVeY, along with producer Brook D’Leau, she has released the gritty rock-inspired L0-F! (SIDE A) and is gearing up to release it’s equally ambitious sequel in a matter of days. We catch her for a moment, to find about digging down deep to find her inner-rock goddess. Stash Everything: Tell us a bit about the process of making the L0-F! projects, are you glad to finally be releasing the material? Jack Davey: This process was really organic, it’s almost as if the songs wrote and recorded themselves; I was just so inspired at the time that the material just started to pour out of me. I recorded everything in my apartment. There’s always music being made in my house. My boyfriend, Joey Strat, is an amazing musician, producer, and songwriter so the entire process started with Side B. He and I recorded the songs as a duo initially, but then he decided that I should just roll solo with the material. I loved those songs so much and wanted to share them with the world, but didn’t want to blow my load too fast and run the risk of it completely flying under the radar. I literally regurgitated Side A so it could serve as an appetiser to the main course. Side A is simply a set-up, that started out as one long song with five different parts. I’m so happy to be taking this solo step with this material, I’ve always wanted to do a rock project and L0-F! is only the beginning. SE: Have you always had the ambitions to record more bluesy guitar driven material, were you just looking for the right time to do it? JD: I’ve always wanted to explore this sound. I am a big Motor City punk fan: MC5, The Stooges, the energy of the music and the “anything goes” attitude. The new generation of blues rockers were inspiring as well, like the Kills, the Black Keys, Gary Clarke Jr. I would catch their live shows at festivals and yearn for that sound. I’ve always been told that I have a rock voice, so I’m branching out and exploring that. SE: Is Howl At The Moon a good indication of what we can expect from the projects or is that just the tip of the iceberg? JD: Howl… is just the tip of the iceberg. Side B has great instrumentation and much better songs. SE: Did you have to dig down deep and discover a new side of yourself, was it an emotional experience? JD: The emotional part of the process came in the yearning to get the music done. I was splitting my time between my newborn son and trying to record. I was already sleep deprived, yet pushing myself to finish music. I definitely had to tap into an undiscovered part of myself. My songwriting style had to change to fit the music, but I was thankful for the challenge. It’s a different sonic landscape, so a new side of me has definitely been unlocked & that’s a great thing. SE: Are you hoping J*DaVeY fans will come along for the journey and are you hoping o reach a different audience as well? JD: I definitely want J*DaVeY fans to come along for the new ride, but I understand if they don’t like the new music. Although there are some similarities, it is pretty different from what they’re used to. I do know that J*DaVeY fans are rather progressive, so I’m confident they’ll get into the new sound, but I definitely want to reach a new audience. What artist doesn’t want that? SE: Can we expect any new J*DaVeY material in the near future, will that material be different from the past and will it possibly be informed by your solo work? JD: Brook [L'Deau] and I have started working on a new album. It’s in the very very beginning stages and probably won’t be ready for release until late 2013. The material is reminiscent of the past, but a bit darker and definitely inclusive of my sound as well. Super psyched about it.